While we talk a lot about the numerous pests that can invade your home despite what season it is, spring is an especially stressful time for home and business owners. After all, once the weather begins to warm up, the pests begin to come out in extremely large numbers. If you want to maintain the cleanliness of your business, you’re going to need to keep an eye out for these pests. This way, if you happen to spot one or more, you can contact your local Sacramento Pest Control Company to take care of the problem in no time at all. Keeping this in mind, you may be wondering what sorts of pests you should be keeping an eye out for. Continue reading below to learn more. Most often, you will find ants around the outside of the property first. However, it won’t be long before they’re inside as well. Most commonly ants will first be identified in garages, basements, bathrooms, and kitchens. If you want to make sure you aren’t going to have an ant problem, it’s imperative that you keep your commercial space clean. Additionally, make sure that there is no standing water that is being caused by leaking pipes or poor drainage. If so fix these issues as soon as possible to avoid ant infestations. Just as with every other season, rodents are an issue that many business owners have to deal with. This is especially true if your building is older as it likely has a number of ways through which a rodent or multiple rodents can enter your space. Just as with ants, if you spot one rodent in your space, chances are there are many more that you are not seeing. Rodents reproduce at an extremely rapid pace. Be sure to call your local pest control company if you spot a mouse or rat at your commercial space. Nearly everyone knows that a cockroach can survive anywhere from one to two weeks without having a head. These horror stories should give you some inclination of what horribly bothersome pests cockroaches are. This is why you should always keep an eye out for roaches in your commercial space. It takes nothing less than a professional pest control company to get rid of these pesky critters. While cockroaches could potentially be lurking in your building all year long, we would suggest that you have an inspection at the beginning of spring at the very least to ensure that you are roach-free. We have spoken a lot about the damage that termites can cause a home or business. The tricky part is not being able to identify whether or not you actually do have termites gnawing away at your building’s infrastructure. On the other hand, with the help of an experienced exterminator, termites can be identified in no time at all. Spring is the right time of year to have your space inspected in order to determine whether or not you have anything to worry about where termites are concerned. Without an inspection, you may find that your building is beginning to deteriorate over time, with little to nothing you can do about it. 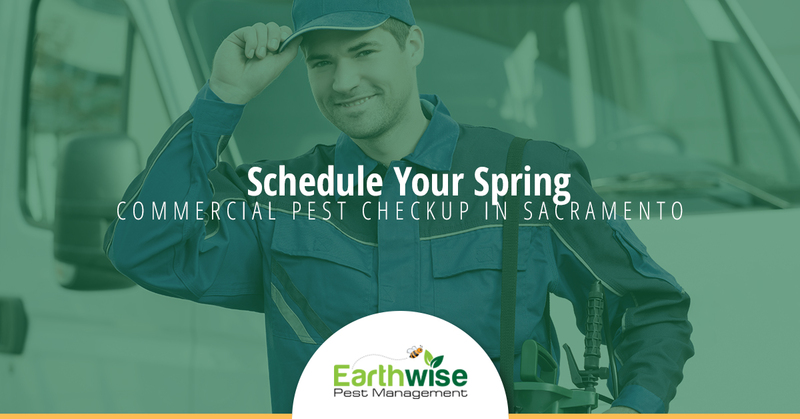 Earthwise Pest Management is known to be Sacramento’s most trusted local exterminators for spring pest inspections. If you are the owner of a business and you need to ensure that your space is completely free of ants, rodents, termites, roaches, and more, it’s time to contact us. Earthwise Pest Management is prepared to help you eliminate any and all pests that may be lurking in the shadows at your business. Call us today to learn more about pricing.